« April Showers . . . The chickens that were hatching during last week’s post finally all hatched, at least all of them that were going to hatch. 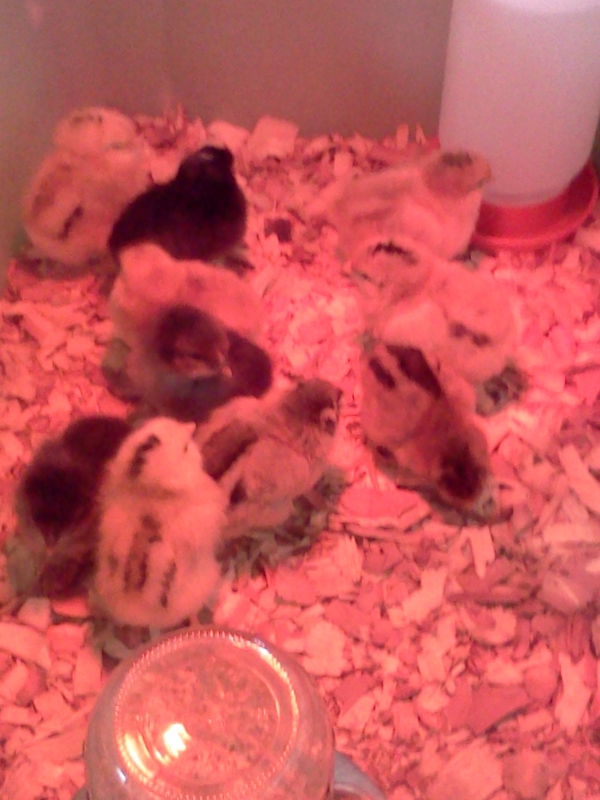 We hatched 10 eggs of 24 last week. That sounds like a bad ratio but we actually hatched 100% of the fertile eggs. You see we have only 2 roosters with 43 hens so, not all of the eggs were fertile. We will also be ordering 100 more broilers this spring to be delivered next week. – Zionsville Farmers’ Market beginning May 18. We will be sharing space with another vendor and therefore will only be at this market every other Saturday throughout the season. The Zionsville Farmers’ Market is located at the corner of Main Street and Hawthorne in Zionsville from 8:00 a.m. – 11:00 a.m. each Saturday from May 18 through September 28. – Decatur Township Farmers’ Market beginning June 4. This is the farmers’ market that Farmer Betsy started at Decatur Discovery Academy. The market is located at 5106 S. High School Road, Indianapolis and will be held each Tuesday from 4:00 p.m. – 7:00 p.m. from June 4 through September 24. – A new organic market being formed in the area. The dates and locations have not yet been determined. We’ll share that information when it becomes available. We will hold open hours on the farm from 12 p.m. – 6 p.m. this Sunday. Given all of the new opportunities, these will be our last farm open hours. That doesn’t mean we won’t be around, you may just want to call or e-mail beforehand. We will also be raising our prices to compensate for market expenses. We do plan to offer a discount for on farm purchases. We will post our new price list soon.